So, finally, at 8:00 AM on Wednesday, June 27, we were launched on our big adventure! After the stressful preparation and several postponements, we could hardly believe that we were really on our way. 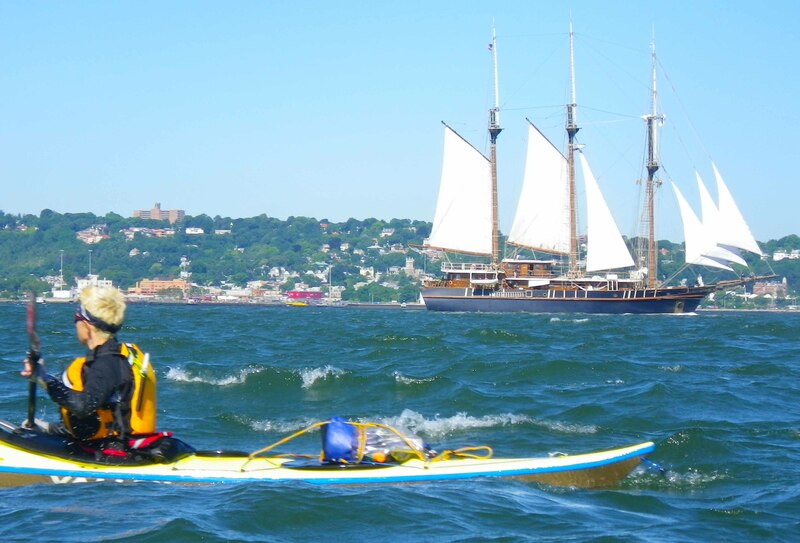 We nosed our boats out of the Pier 40 embayment, past the Holland Tunnel ventilator out into the Hudson River, as we had done hundreds of times before on day trips. But this time we wouldn’t be back in a few hours—we were going much farther! As we rounded the ventilator, we felt a nice kick of the ebb current that would carry us south. 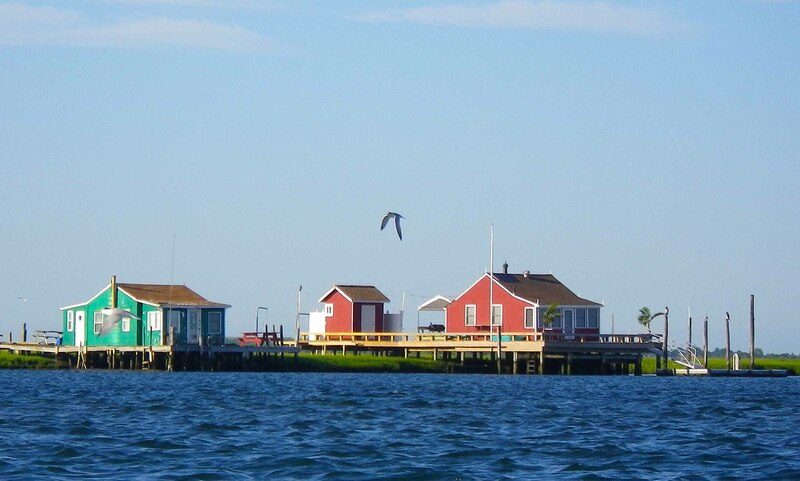 Soon we were coasting down the familiar waterfront at 5 knots, enjoying the morning sunshine. 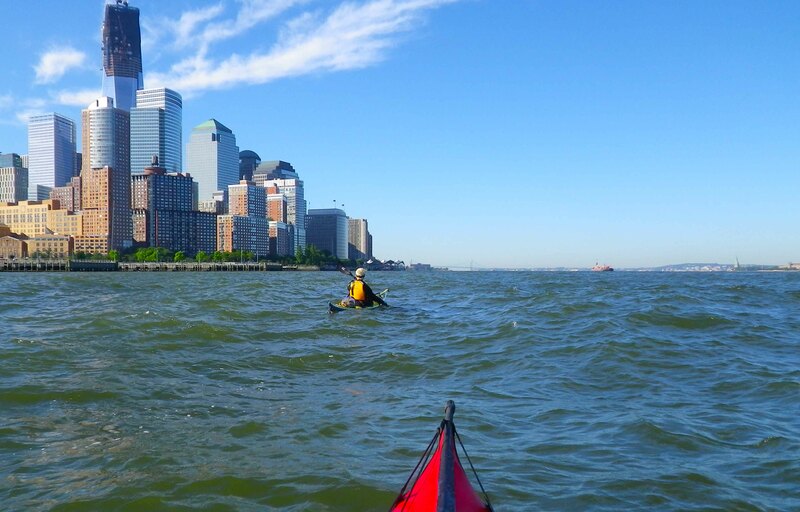 We paddled past the tip of Manhattan, Governors Island, and the Statue of Liberty. 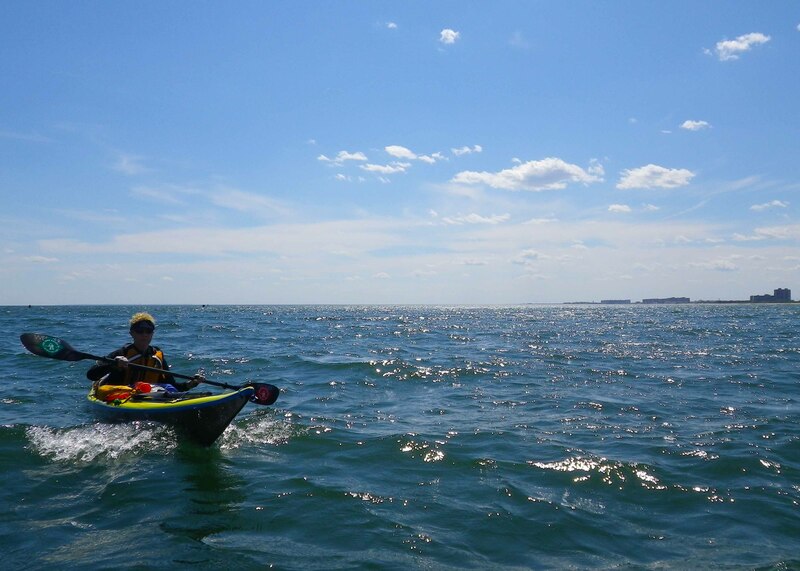 Up ahead in the distance we could see the Verrazano-Narrows Bridge, the gateway to the Atlantic—and our paddle into unknown waters! We figured we would have the ebb current with us until about 11 AM, just (barely) long enough for us to round Breezy Point, out of New York Harbor into the open Atlantic. But the issue of current was soon made moot by another factor—the wind. This morning, the wind was blowing out of the west at about 15 knots, with higher gusts. This created some vigorous chop. But our heavily-loaded boats felt very stable, and we were rather enjoying the ride. 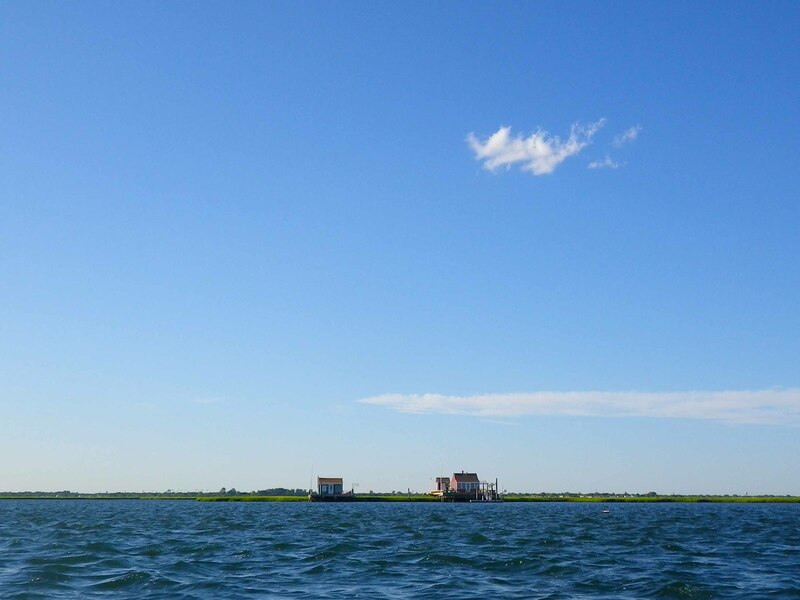 And we figured the west wind would push us nicely along, even if the ebb current faded, in the stretch between Coney Island and Breezy Point, where our course would turn more easterly.. 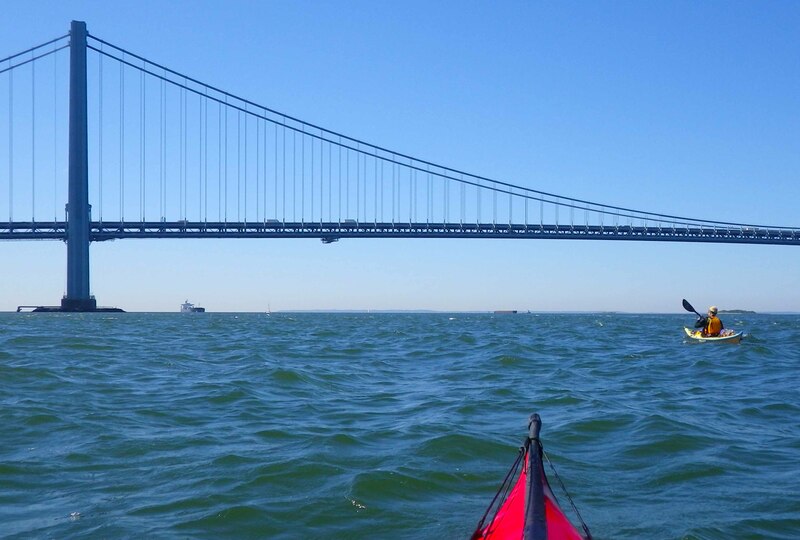 Under the Verrazano-Narrows Bridge, as many times before, but today with a new meaning! 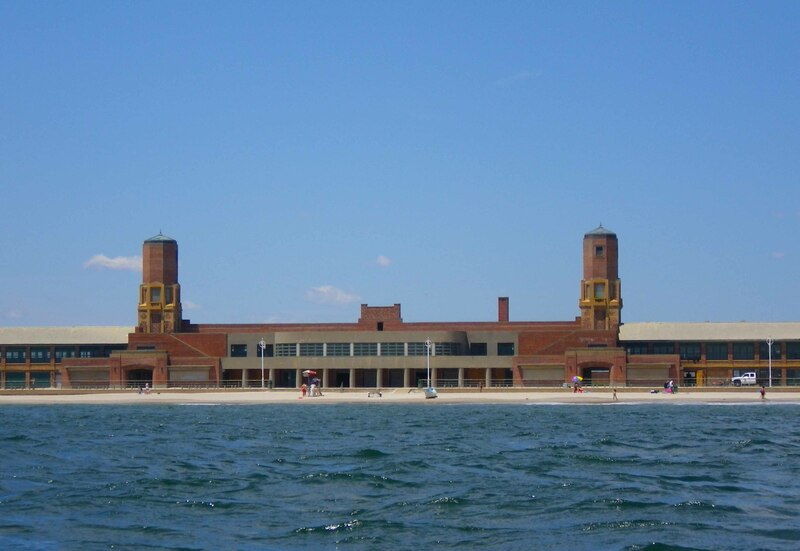 But we did not count on the two points of land that we would have to round before we were finally out of New York Harbor: Norton Point, at the western end of Coney Island, and Breezy Point itself. 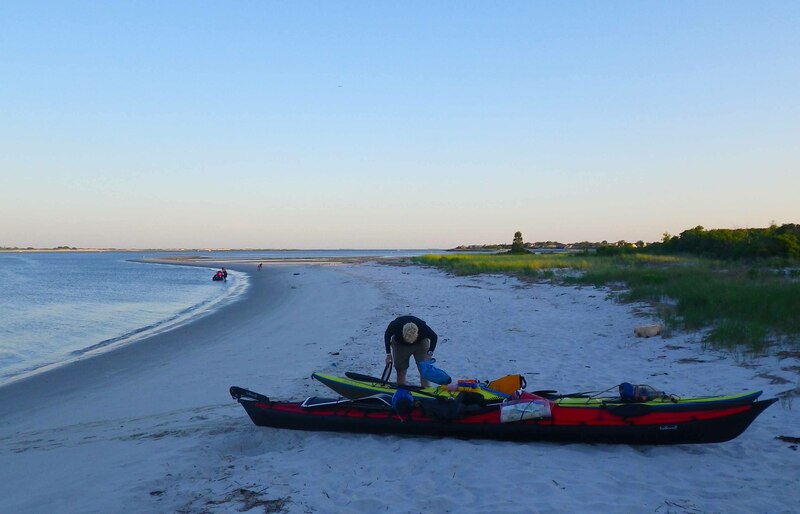 A word for non-paddlers: Points of land are among the trickiest locations to maneuver around. There are typically shoals. And there are often strong currents and conflicting flows of water, such as when an outgoing current collides with incoming ocean swells. The result: Big, powerful waves, and tide rips—areas of turbulent, choppy water that pulls your boat in unexpected directions. We knew that at this stage of the tide there was going to be a counter-current flowing round the back of both Norton Point and Breezy Point, and a marked tide rip at Breezy Point. 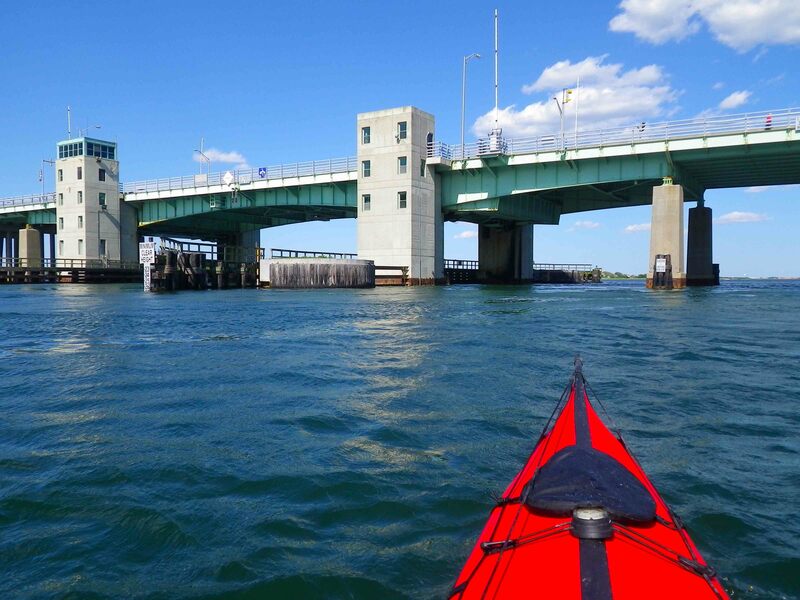 But we didn’t worry overmuch about either point—we’d paddled many times around both. No big deal, right? 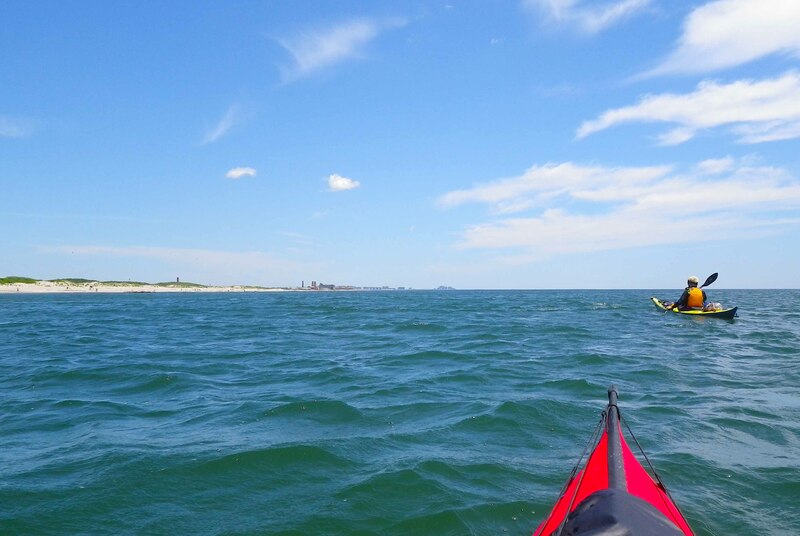 We’d been expecting rough waters later on in the trip, at Shinnecock Inlet and Montauk and Orient Points—but not here, in our friendly “home” waters! The stretch between Norton Point and Breezy Point was rough, with breaking waves as far as the eye could see. Finally we crept up to the tip of Breezy Point along its long stone jetty, looking carefully for the eddy line that marked the edge of the tide rip. Going through the tide rip, once again we were tossed by big breaking waves–but fortunately, only for a short while. Then we were through into calm water that, ironically, was the open Atlantic Ocean. Now leaving our customary waters, we felt as though the trip had started at last! For the rest of that morning, we paddled along the coast. The swells were gentle and the water calm, partly shielded by the land from the west wind that now just pushed us nicely along and offset the summer sun. We marveled at the long stretch of white sand, with bathers here and there. 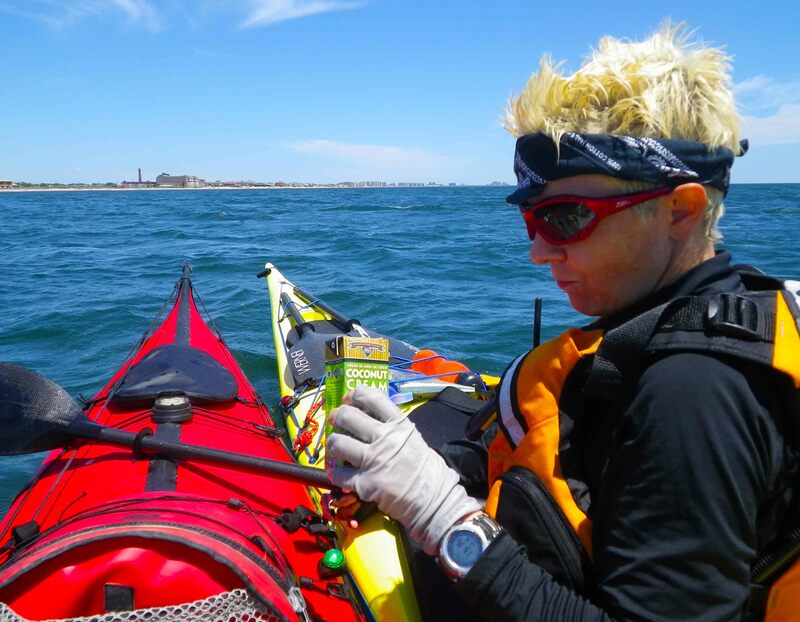 But soon the sight of the endless beach grew weary and we were happy about our decision not to paddle along that outer beach for the next hundred miles all the way to Montauk, but rather to duck into the more interesting-looking inner bays as soon as possible. 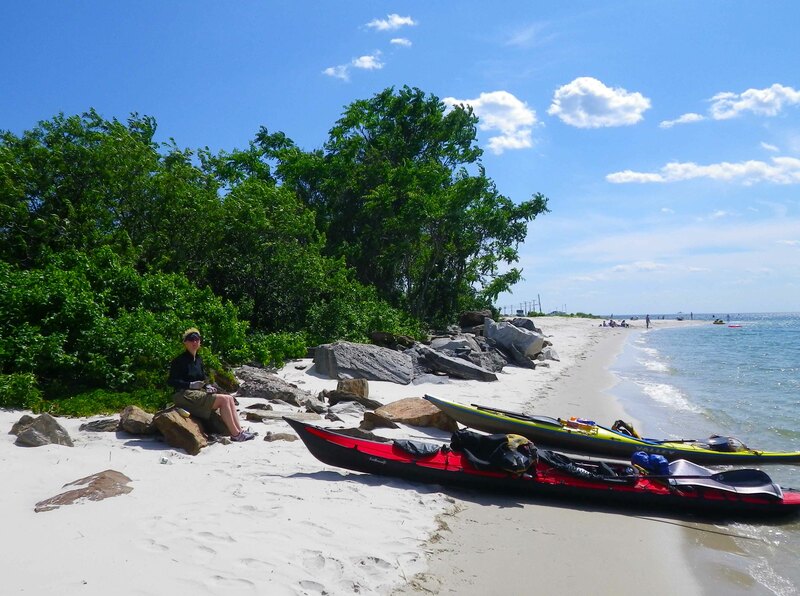 By early afternoon, we’d reached Rockaway Inlet, our entry point into the inner bays and, along their southern edge, the intracoastal waterway of Long Island’s South Shore that we intended to follow. In the inlet, we stopped for a late lunch on a beach that, with its fine white sand and crystal-clear water, looked for all the world like a tropical paradise—except without palm trees, and with some industrial-looking residential buildings on the opposite shore. And we were still within the boundaries of New York City, in Queens! Above us, a stream of planes passed steadily to land at Kennedy Airport. 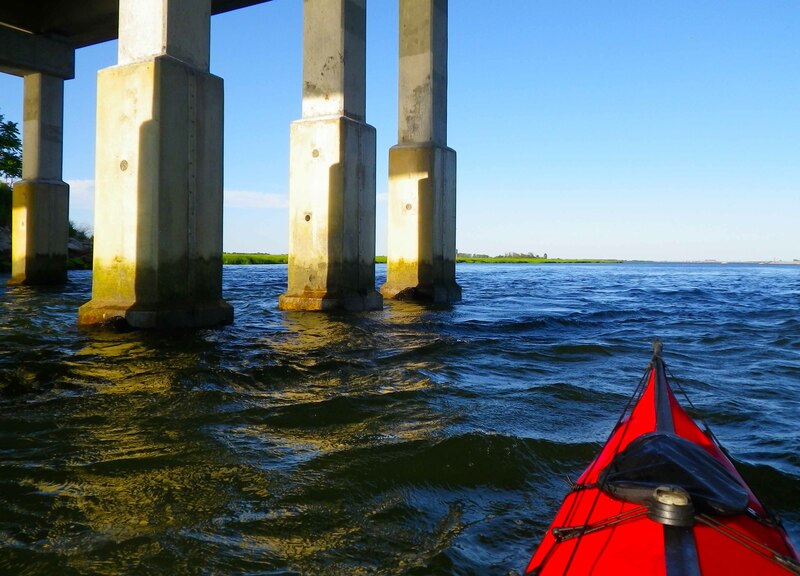 After lunch, we paddled under the Atlantic Beach Bridge, the first of many bridges connecting the barrier islands of Long Island to the mainland that we would pass under in the coming days, and into Hempstead Bay. Beyond the bridge, Reynolds Channel, the first section of the intracoastal waterway, opened up. On our right, the south side of the channel, on the barrier island, was solidly built up, with houses right on the water, each with its motor boat, large or small, in the back yard. But the left, northern side was for long stretches undeveloped. Large islands (“hassocks”) of flat green grass, with occasional clumps of low trees sticking up, separated by meandering waterways, extended away to the horizon under a blue sky dotted with puffy white clouds. Hundreds of birds peered at us from the grass or wheeled overhead. We were amazed at these vast stretches of what seemed to be pristine wilderness—hardly what we’d anticipated just a few miles from Manhattan! 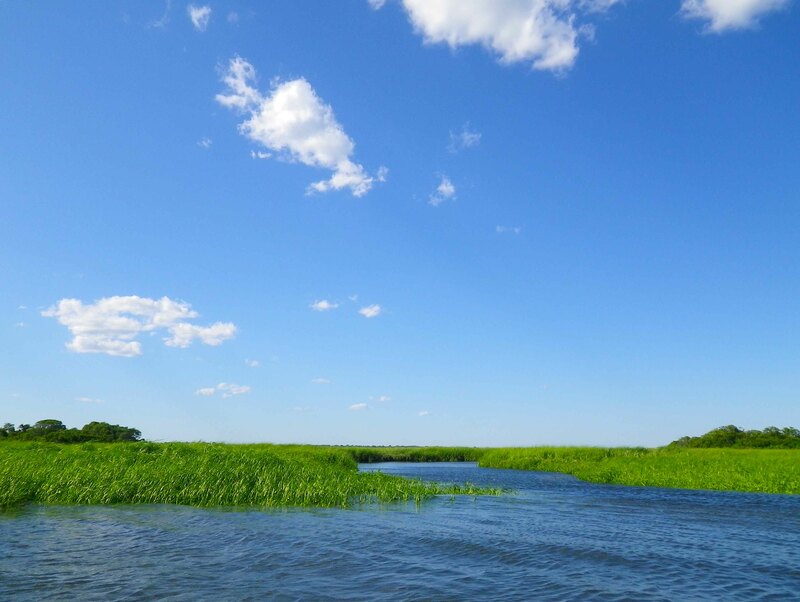 As there was a strong current flowing against us out of the bay, once we’d passed under the Atlantic Beach Bridge we crossed to the northern side of Reynolds Channel, where for the next few hours we paddled, largely out of the current, along the shallow southern edge of the marshland. 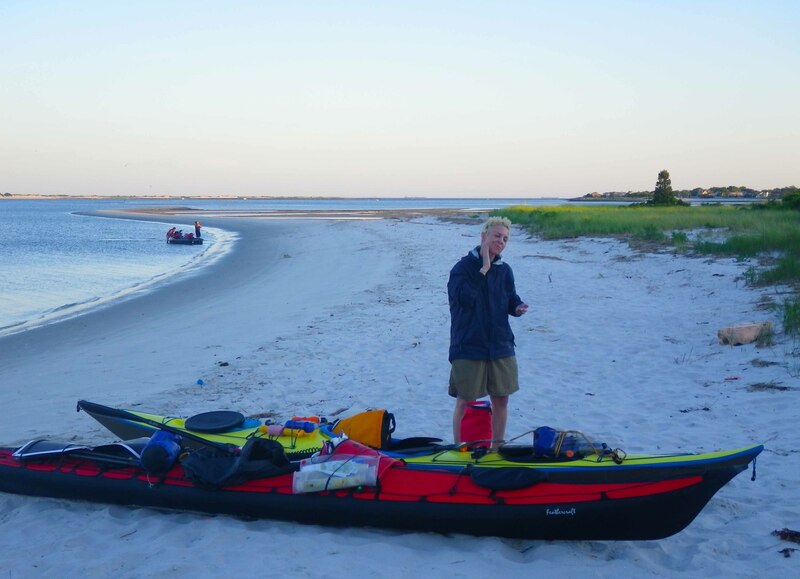 Finally, we began to feel current going our way—we were feeling the pull of the next inlet, Jones Inlet. (This pattern of currents, too, would repeat in the coming days as we passed further inlets.) As the sun sank low in the sky, we passed under the last bridge of the day and soon saw some serious commercial fishing boats, another sign that an inlet was very near. It was high time to look for a campsite for the night. In this area we had noted several possibilities by examining, before the trip, the satellite photos available on Google Maps, a nontraditional but, as it turned out, highly useful tool. We settled on the third option we had checked out, a white sandy beach at the foot of a drawbridge, which we’re calling “Cable Crossing” (because that’s what a large nearby sign said)*. Except for the persistent low hum of traffic crossing the bridge, the location seemed ideal. There were jetskiers nearby, but they left before sunset. The distant sandbars around Jones Inlet were still bathed in lavender light as, with the effort that soon would become only too familiar, we dragged our boats above the high-tide mark. After the first necessities—applying DEET to ward off the biting insects that were already buzzing around unpleasantly, and making cocoa—we pitched our tent and cooked dinner as the twilight set in, congratulating ourselves on having successfully located our first, lovely guerrilla campsite. 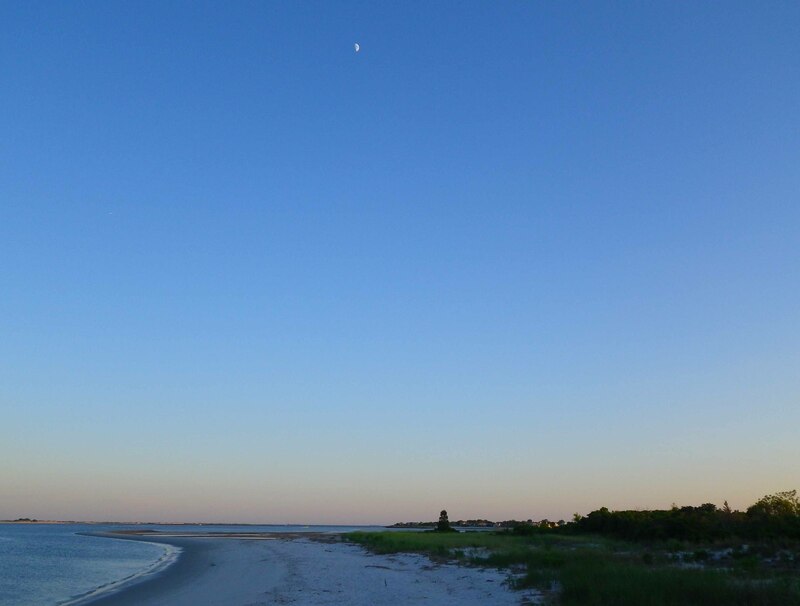 A final walk along the darkening beach under the moon—this is what camping is all about! 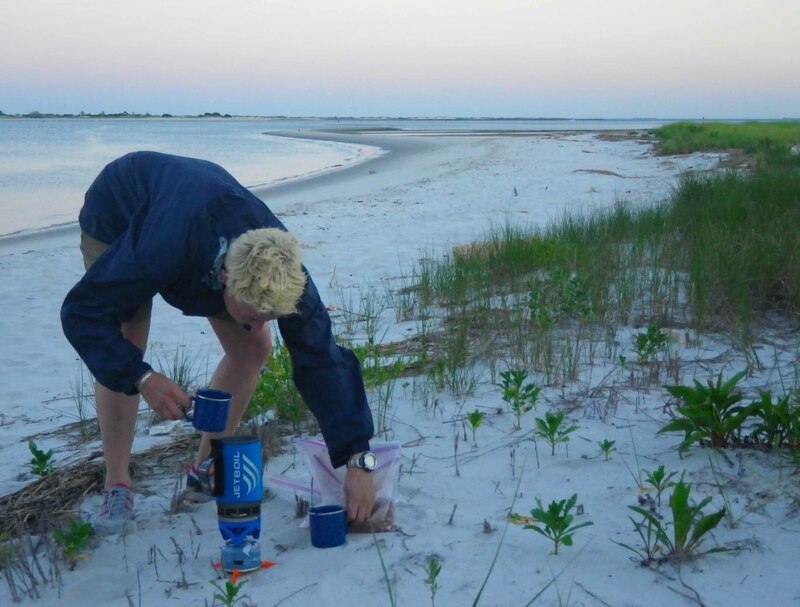 * This trip included several nights of “guerrilla camping”, i.e. in locations that aren’t officially-sanctioned campgrounds. To our knowledge, we didn’t camp on any private property, but rather in scraps of parkland and other public lands. But we aren’t giving the exact locations for two reasons: First, to avoid any belated citations from the authorities; and second, because we don’t want to give the idea that we magically located the only, or even the best, campsites. 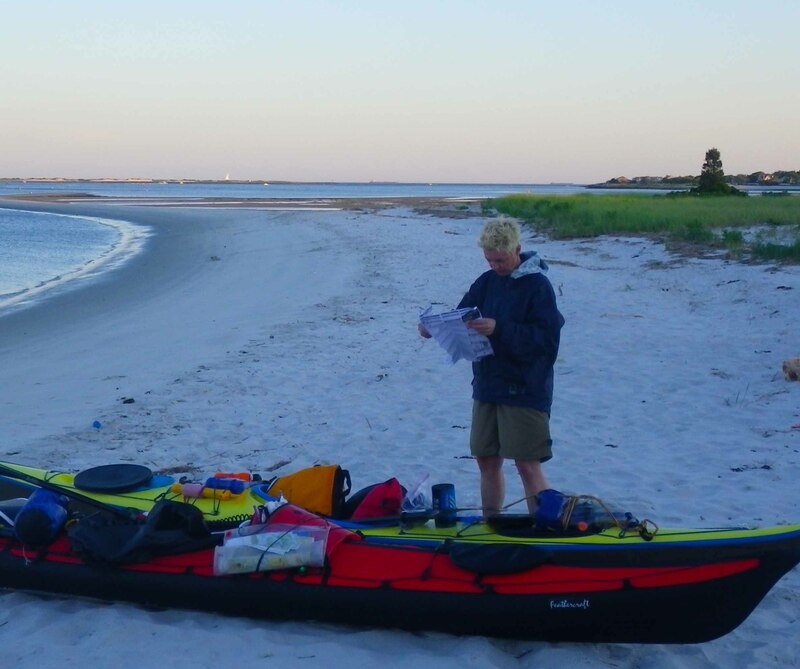 We saw numerous other potential campsites—to our surprise, guerrilla camping on Long Island, even at the height of the summer, turned out not be hard at all. 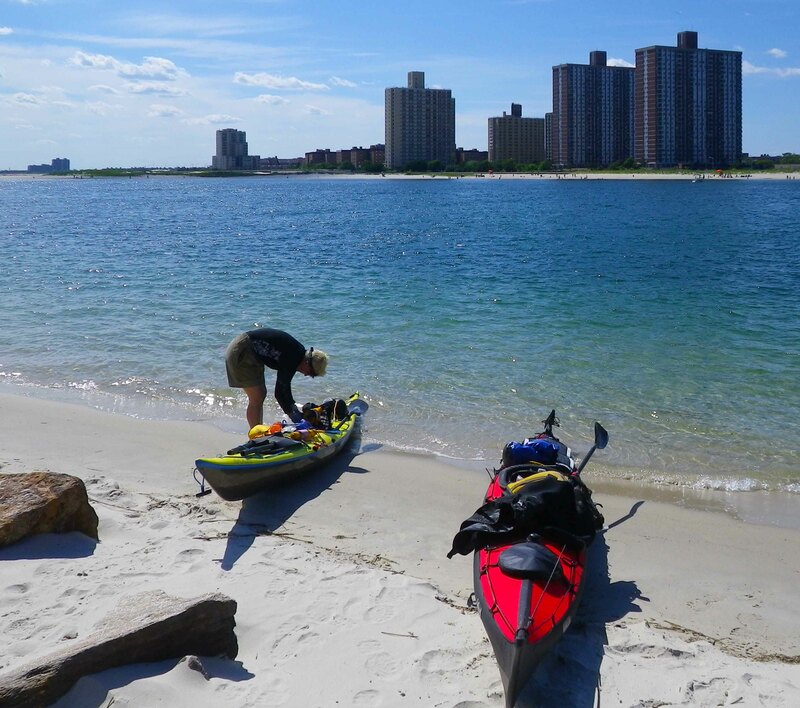 Paddlers planning Long Island circumnavigations are most welcome to contact us directly for further specifics. Meanwhile, all names of campsites in these posts are those that we bestowed on them–you won’t find them on any charts. 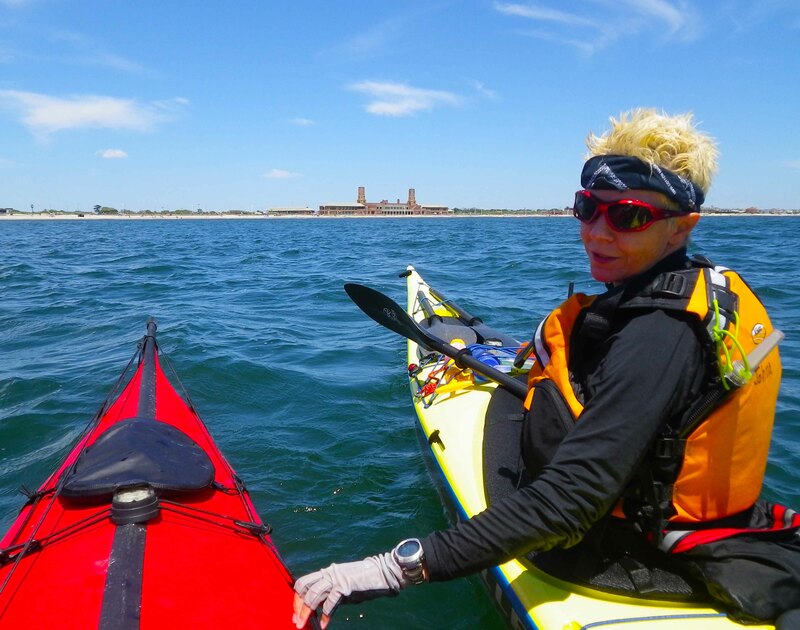 This entry was posted in Kayaking and tagged Circumnavigation, Kayak Camping, Kayak Expeditions, Kayak Photography, Long Island, Long Island Kayak Circumnavigation 2012, New York Sea Kayaking, Photography, Sea Kayaking. Bookmark the permalink. Thanks, Scott! Keep reading, it gets better! And I think Scotland is a bit wilder than Long Island–certainly colder! And no distilleries in LI, alas :-(. One of my favorite parts of hiking in Scotland was discovering a fine distillery located strategically near the trail–and going in for a wee dram–just the thing for a chilly, rainy afternoon! Beautiful shots, love the inbound/outbound picture! 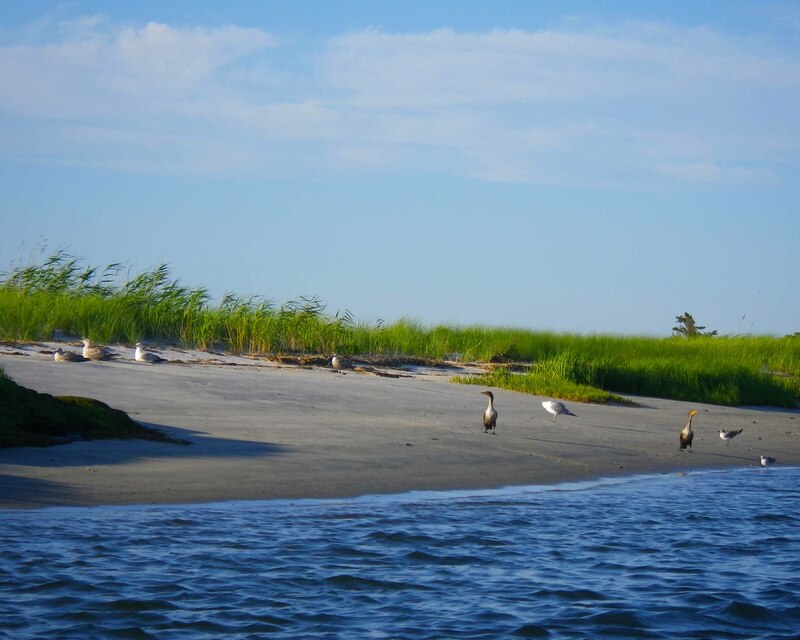 Beautiful photos, especially liked the geese on the beach. 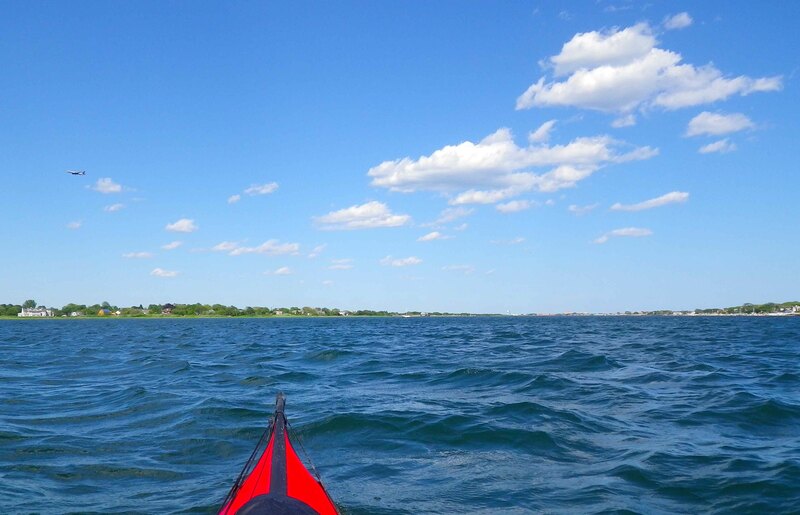 kayaking is a real science. Thanks, Gayle, indeed it is! Love that Verrezano Bridge shot! Do you use something to protect your camera from the water? If so, may I know what that is? Hi Spiritual! Vlad is the camera master, but I can tell you he uses a waterproof camera–I keep forgetting the brand, but he’ll weigh in. So no, he doesn’t do anything special to protect it (other than wipe it often with a paper towel to eliminate spots and drips). They survive total immersion quite well. However, two out of the three cameras died on this trip (including mine, which is why you won’t see many photos of Vlad). I think it was mostly coincidence, but it was interesting to see how many pieces of electronic equipment didn’t survive! On this trip I used exclusively the Pentax Optio W90, basically just a fancy point-and-shoot camera. But it is completely waterproof, so I don’t worry about protecting it from the water, except for making sure that there are no drops on the lens—indeed, I dip it in the water to get rid of any drops. All such cameras are waterproof until, of course, suddenly they are not. So Johna’s Optio W30, a predecessor model to the W90, died on this trip, probably from water ingestion—albeit after many years’ faithful service. Thanks for the tips! It takes great pictures. I guess I always imagined they wouldn’t. Thanks,Z! Jetboils are fantastic–we’ll write more about them in the postscript. Truly a must-have. This is my second (Vlad’s first) and so we weren’t being *entirely* foolish in bringing along a “new” piece of gear. Making cocoa that first night was definitely a luxury!! Here in Day 1 of your trip log you’ve demonstrated that Long Islanders need not go elsewhere in order to locate an adventure. Not as shaky as you might think. They move in the water constantly, so that often it’s hard to get, for instance, the horizon straight (I fix that afterwards in Photoshop), but relatively slowly, so that a daylight shot at 1/100 s, say, or faster, is surprisingly little affected… At night, of course, the motion shows up with a vengeance. 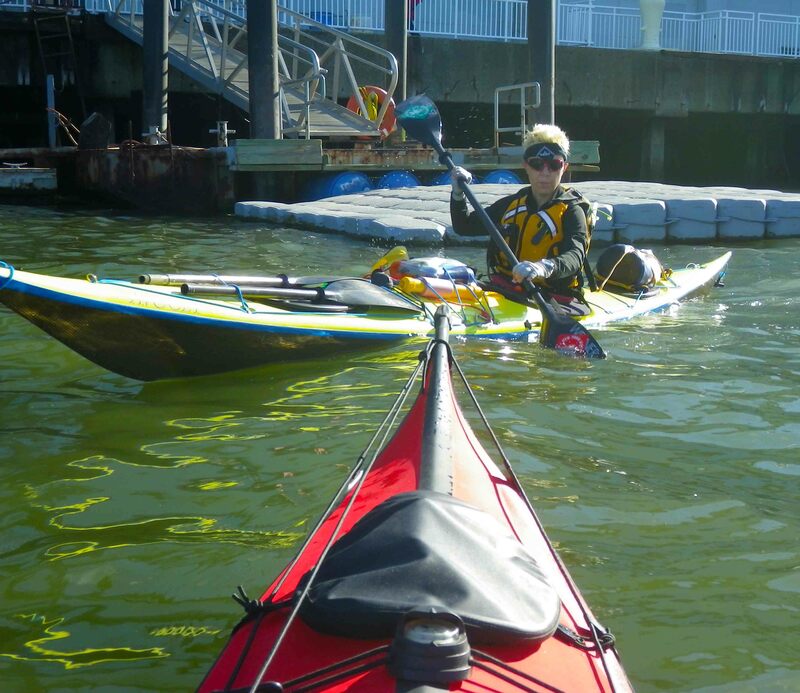 I see :) Well, keep kayaking and taking great pics Vlad! I’ll have to send you one of the pictures I took of Long Island from the air when I was coming back from Italy. I think we have some very different perspectives on some similar places… :) What a fantastic trip you must have had. Wow!! This is one helluva trip that should have taken a lot of guts!! Hats off for pulling it off!! wow! some trip! i had no idea there were so many beautiful shores around NY. Great photos–thanks for sharing! I really enjoyed this. Makes me feel like I’m along for the ride. 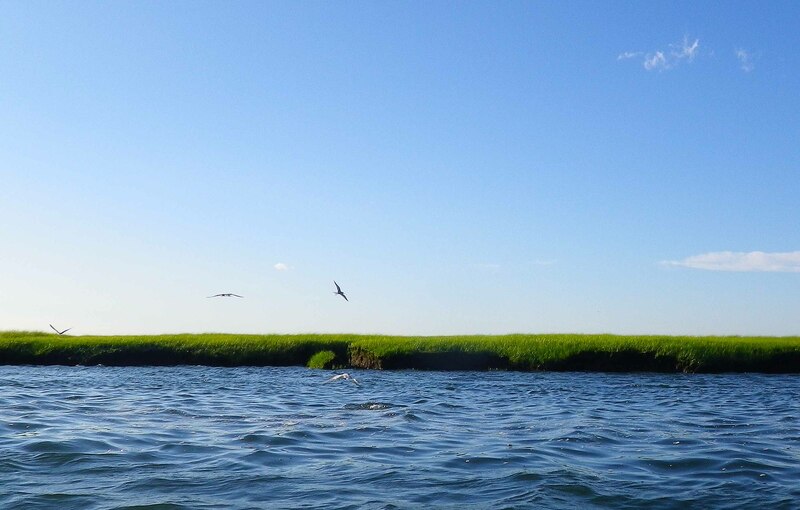 Those waters look ominous in some photos! Great tour – can’t wait for the next installment! Have you ever used the GoPro Hero cameras? They have a Kayak mount, are waterproof, and can shoot both stills and HD video. Just curious, seems like they would be an interesting tool for your travels. I do have a GoPro Hero camera, but I haven’t used it for anything serious. I would certainly use it as a fixed-mount waterproof camera in situations that call for that (such as here and here—which were before I had the Hero), and that is how most people use it. They mount it on their surfboards or kayaks, or on their helmets. But most of time I want to point my camera in a more flexible way at things in different directions from the kayak and take photos in the ordinary “land” way—and for that the Hero is not especially suitable. I’m thoroughly enjoying this – can’t wait for the next episode! As a newbie kayaker, I’m inspired to work on my skills and knowledge to get to the point of being able to do this. 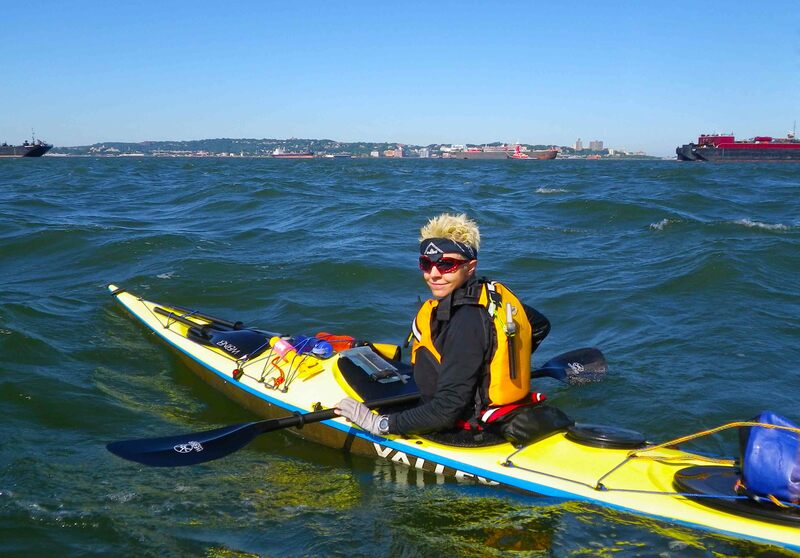 In the meantime, my friend Rosalba and I are kayaking to all the bridges in NYC – our blog is http://bridgesofnyc.wordpress.com. I had a question too, but now I can’t remember it . . . Thanks so much! Days 1-6 are now posted, and the remaining ones should be soon. I remember now . . .
How did you create the route maps on your blog entries? Is there a site / app / software? The proper way to do this kind of thing would be to download the track from your GPS and overlay it on the marine chart, image from Google Earth, or suchlike. Depending on your GPS model and/or charting software, there is plenty of software that will help you do this. 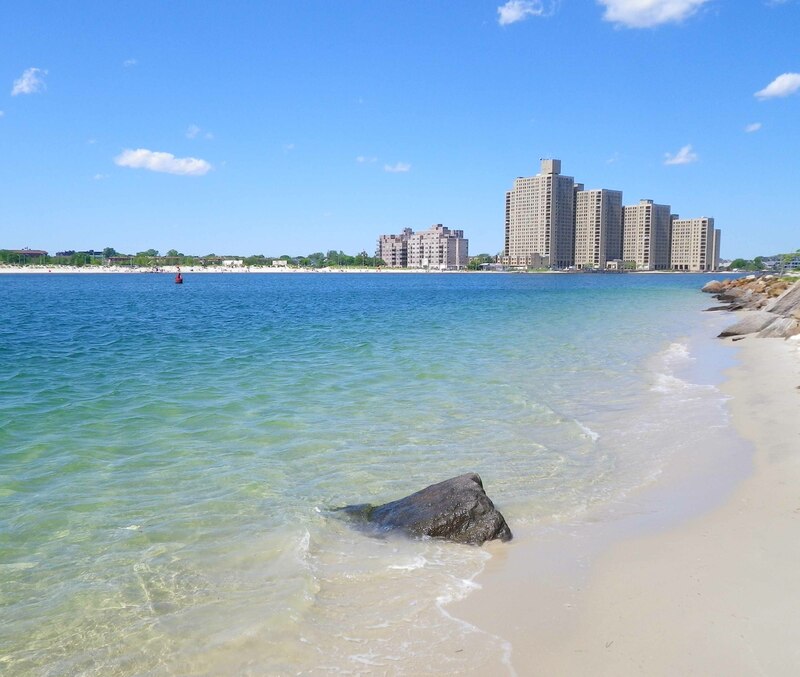 You’ve reminded me of the many afternoons I spent as a child on the beach at Far Rockaway, Long Beach, and Jones Beach. 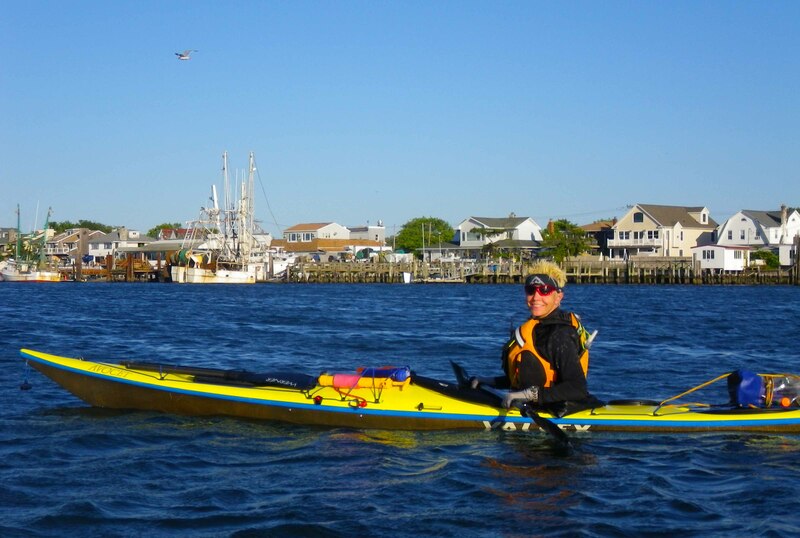 All of them were about half an hour by car—not kayak—from where my family lived in east-central Nassau County. People and times that were, but are no more. Thanks, Steve! Glad to have brought back memories. What a fantastic trip! Thank you for documenting it and post it online! I am looking forward to do a section or maybe the full course of it one day.